At today’s rally Jenny Kwan said, “Homelessness is not like cancer. There is a cure. It’s called, building affordable housing.” To get action on these few words is why thousands marched today. The Grand March For Housing brought out an enormous crowd demanding immediate government action to build social housing, raise welfare and the minimum wage. I’d like to mention this video, again, about Little Mountain Social Housing Complex. That over 200 housing units sit empty while people sleep on the street should not go unnoted. Alleviating the suffering of homelessness is as simple as accessing alreading existing buildings. These agreements are about corporate access to resources and restructuring economies to facilitate profiteering. Caelie Frampton (BC Stop TILMA Coalition) -From NAFTA to TILMA: Re-examine trade agreements. Proma Tagore (No One Is Illegal) – Bilateral Trade Agreements: Canada displacing communities in the Global South. Colleen Fuller (PharmaWatch and the BC Health Coalition) – Neo-liberal agreements, corporate lawsuits and the healthcare system. 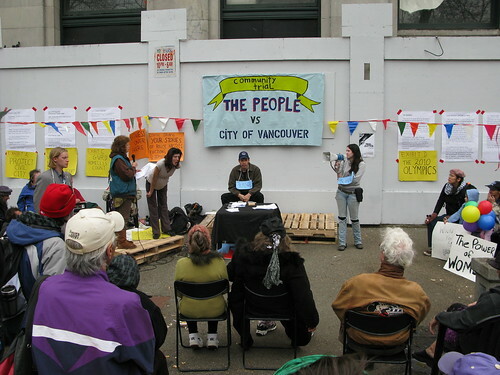 Gord Hill (Olympic Resistance Network and No2010.com) – Looking back to Seattle 1999 and forward to Vancouver 2010. How does neoliberalism affect our lives? Caelie Frampton (is not at all responsible for these notes!!!) Why are we seeing agreements? The Bilateral agreements (Canada and Colombia, Canada and the EU, etc.) are a response to collapsed talks at WTO level. There has been an increase in trade agreements. The government in power has a deregulatory agenda. TILMA (Trade Investment Labour Mobility Agreement) is an agreement on Internal trade. It’s main thrust is “No obstacles to investment” and it sets up a “Private Courts Systems” to deal with disputes. This agreement threatens to block any social and political alternatives to capitalism. It was signed and passed behind closed doors. Why doesn’t the government want any public consciousness? In the past anti-trade agreement activists have talked about saving Canada. What? Save a colonial and imperialist nation? Colleen (is not at all responsible for these notes!!!) Pharmawatch NA is becoming increasingly integrated – Insurance is a NA industry – BC government undermined access to health care – People are fighting to maintain health care. Health care and education – link HC to housing, social assistance, disability, – fight to expand not simply defend. Develop allies across the spectrum of society. Gord Hill (is not at all responsible for these notes!!!) organizing against the 2010 Olympics Antiglobalization protest time line – 1989 – state communism collapses, the triumph of a straight global capitalist system. 1994 Zapatistas develop language of neo-liberalism and anti-capitalism – re-inspired social movements – 1999 Seattle – convergence of social movements, mass mobilizations “Resistance within the belly of the beast” – anti-globalization anti-capitalist – Trade agreement impacts are so widespread workers – poor – even middle class – 2001- the movement gains momentum – Quebec Security fence taken down – movement reinvigorated. – War on terror – chilled social movement – climate of fear – movement set back – 2007 re-emergence of strong movement – militant campaign against G8 – Scares the ruling class. They don’t even want to see people taking action!! – Unemployed , crisis, – (there is a contradiction here.) – Public Direct Action No 2010 Olympics. 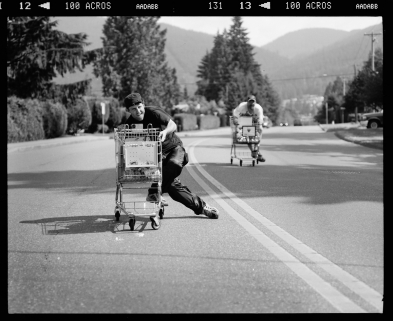 There has been an increase in homelessness in Vancouver since the Olympic bid was won – Sea to sky highway is having detrimental environmental effects – fight social and environmental impacts of Olympics/Capitalism. The resistance is promoting an anti-capitalist ideology. Why? Capitalists don’t care about people. Thousand of people involved – Alternative media helped build the movement – civil disobedience – show respect for diversity – there’s no one correct way to do things – anti-colonial aspect housing homeless – movements are diverse – Will show the impacts. Discussion: solidify our movements so that regardless of government (and corporate rule) we can be a force. Taxpayers and parents – holding government accountable. Converge on the Olympics – want to see more people there after the Olympics – bringing people together for after the olympics all these cmovements came together for one big coalition Save the CBC Unionized workers – Appeal to the mainstream – take advantage of this crisis. Socialism for the rich is fundamentally unjust – Lou BC Health Coalition – on behalf of patients? What? right to challenge, right to a need (health care)– legal strategies? – rethink how we organize – how are we organizing? – Saul Alinsky – Do something good – tactics – sport medicine for-profit clinics will be legacy of Olympics – housing – oppose the olympics – So was a different time the 50s – door to door – Current media is better for seniors and writing letters – language translation for cross-cultural coalition building – talk to people for organization – old school union union style: small, workspace, simultaneous organizing – The government plans to use the Olympics to promote their economic plan – indigenous issues, education, race, sexism, work, all together – Olympics a springboard for continuing to organize. – AND FINALLY – STV Win and we won’t have a majority government ever again!